Click 'Sign Up' below to receive a regular e-mail update on your area. The seventh London Mela – one of Europe’s largest outdoor Asian festivals, which last year attracted 70,000 people – takes place on Sunday 16th August in Gunnersbury Park, with seven zones of urban, classical and experimental music, DJs, dance, outdoor arts, comedy, exhibitions, children’s play area and of course food. The free family-friendly London Mela and offers something for every generation of every community. Music highlights include classical-electronica artist, Swati Natekar, who performs a fusion of Indian Classical and Folk with world sounds, including memorable vocal performances on albums by Nitin Sawhney and Talvin Singh - and new music from Humans vs Machines, an all-out battle between keyboards, technology and beatboxers from the UK’s finest in the game, including special guests. And on the Main Stage – supported by BBC Asian Network – performances by B21, Outlandish, Amar featuring Jim Beans and Rebel, and Des-c. Audiences will also be encouraged to take part in I love Bollywood, a dynamic, energetic mass participation event, led by choreographer Jay Kumar, which will get everyone on their feet ‘changing lightbulbs’ and ‘washing windows’. For younger visitors Oogly Boogly makes babies the star of the show when, together with performers, they create gentle dance inspired by the sounds and gestures of child’s play. A further dance act not to be missed is Jaggo Group, six female folk dancers with a tongue-in-cheek humour. 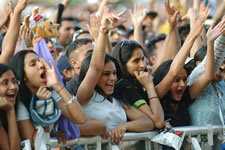 Recognised for its breadth of programme, the London Mela also includes visual arts, film and exhibitions. Highlights include Movieplex, part museum, part miniature cinema which celebrates the pioneering but lost work of film-maker Shanto Rao Dutt including a recently discovered nine-minute silent comedy film ‘Docker and the Rose’ made in 1920s Liverpool; MyMela a photographic exhibition with images from the past seven years of London Mela; and Oxfam’s hugely successful exhibition about climate change. New for 2009 the Doosra Stage (which means ‘the other’ in Hindi) hosted by Radio 1’s Bobby and Nihal – supported by Continental Drifts and PRSF – features DJs and exciting British Asian talent including DJ Rob Khan, DJ Umb, and Sukh Night vs Scandalous Unlimited. 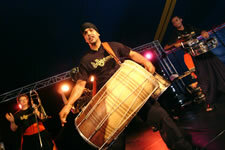 Further music will be at BBC Asian Network Mix Tent with DJs mixing Bhangra, Bollywood and urban beats. For something a bit different, the Community Cabaret Stage – presented in association with BBC London – features an eclectic programme of comedy, music and dance; while the Classical Zone celebrates London’s Asian communities with traditional and classical artists. Meanwhile for children and the young at heart, Magic Mela – in association with Emergency Exit Arts – provides a delightful, interactive area where visitors can experience the magic of stories, dance and creative play. And throughout the day visitors are urged to expect the unexpected with a fascinating outdoor programme including stilt-walking dinosaurs Saurus by Close Act; installation theatre Home by Tangled Feet; and Paper People. All this plus a funfair, food, crafts and cultural stalls.